If you don't already know all about the Samsung Galaxy S II, where have you been the past two months? The successor to one of the most popular Android handsets to date carries a burden of expectation almost as sizable as its 4.3-inch Super AMOLED Plus screen. It promises to be thinner, lighter, and faster than the Galaxy S that preceded it, while garnishing Android 2.3.3 with a set of TouchWiz customizations that might actually enhance, rather than hinder, the user experience. As such, the Galaxy S II earns Samsung full marks for ambition, but does this slinky new smartphone live up to its interstellar hype? The answer, as always, can be found after the break. How would you rate the Galaxy S II? The Samsung Galaxy S II is 8.49mm (0.33 inches) thick. We whipped out a ruler and checked, it's true. Admittedly, that measurement expands a little at the handset's bottom, where a curvy bump houses its loudspeaker, and around the camera compartment, which protrudes ever so slightly from the rest of the body, but even at its thickest point, this phone doesn't allow itself to go beyond the 1cm mark. Given the veritable spec sheet overload that Samsung has included within the Galaxy S II, we consider its thin profile a stunning feat of engineering. In terms of the pursuit of the absolute slimmest device, NEC's MEDIAS N-04C is still the champ at 7.7mm, but global audiences should feel comfortable in replacing the Sony Ericsson Xperia Arc, which measures 8.7mm at its thinnest point, with the Galaxy S II for their benchmark slim device. More importantly, Samsung's new 4.3-inch handset feels better in the hand than the Arc, thanks to its intelligently curved sides that provide a comfortable and assured grip. The textured rear cover also feels good to the touch, and should withstand nicks and scratches a lot better than the original Galaxy S' backplate, though don't expect its featherlight construction to contribute much to the phone's overall rigidity. That will be provided by the still-mostly-plastic frame surrounding the phone's screen. We found little cause to doubt the Galaxy S II's durability, though we certainly wouldn't go recommending it as the phone for the builder in your life. There's a minuscule crevice between the handset's frame and screen that looks prone to gathering dust if exposed to dirty environments, and in spite of the generally reassuring build quality, the Galaxy S II is still made out of plastic rather than something more robust like HTC or Nokia's all-aluminum cases. Returning to the screen, it's fronted by one continuous sheet of glass, which protects a 4.3-inch Super AMOLED Plus display along with a batch of sensors and a front-facing camera at the top, and two capacitive Android keys at the bottom. The earpiece and Home button are the only disruptions to the sleek glass surface. 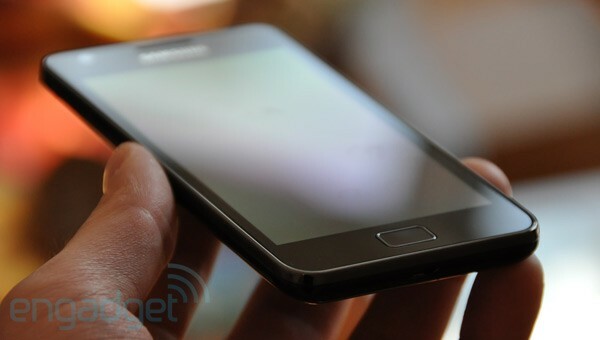 Whatever coating Samsung has applied to the Galaxy S II's screen works very well, as it resists smudges and fingerprint marks much better than the average smartphone. A volume rocker and a power / lock key each take up one side of the GSII, with a 3.5mm headphone jack adorning its top and a micro-USB charging / data port at the bottom. That's it, no frills, no extras, and -- to the dismay of some -- no dedicated camera shutter button. At least the controls you do get all work very well. The side-mounted buttons do their job without fuss and touchscreen responsiveness is impeccable. The Menu and Back keys are purely capacitive, whereas the Home button is, well, an actual button -- it requires you to physically depress it in order to register input. That distinction may feel a bit awkward at first, but we rather enjoyed it. It meant accidental key taps were all but impossible to achieve and gave a more definitive nature to punching the Home key, which somehow felt appropriate given the fact it yanks you out of whatever you're doing and back to the homescreen. The Galaxy S II's screen is nothing short of spectacular. Blacks are impenetrable, colors pop out at you, and viewing angles are supreme. This would usually be the part where we'd point out that qHD (960 x 540) resolution is fast becoming the norm among top-tier smartphones and that the GSII's 800 x 480 is therefore a bit behind the curve, but frankly, we don't care. With a screen as beautiful as this, such things pale into insignificance. And we use that verb advisedly -- whereas the majority of LCDs quickly lose their luster when you tilt them away from center, color saturation and vibrancy on the Galaxy S II remain undiminished. It is only at extreme angles that you'll notice some discoloration, but that's only if you're looking for it and takes nothing away from the awe-inspiring experience of simply using this device. Whether you're pushing it to its limits with movie watching or just tamely browsing the web, the Super AMOLED Plus panel inside the Galaxy S II never fails to remind you that it's simply better than almost everything else that's out there. For an instructive example of the contrast on offer here, take a look at our recent post regarding the LG Optimus Big's upcoming launch in Korea. The pattern on that handset's white back was so subtle on our desktop monitor that we completely missed it, whereas when we looked at the same image on the GSII, it looked clear as day. Maybe that doesn't speak too highly of the monitors we're working with, but it underlines the supremacy of the display Samsung has squeezed into the Galaxy S II. We'd even go so far as to say it's better than the iPhone 4's screen, purely because, at 4.3 inches, it gives us so much more room to work with. It's almost impossible to split the two up in terms of quality of output, they're both top notch. Notably, however, that was also true of Samsung's original Super AMOLED display, the one that graced the 4-inch Galaxy S, and by now you must be wondering if there's actually anything significant enough in the new S-AMOLED technology to justify appending that "Plus" to its name. The short answer is yes, and it's all in the pixels. The one major downside to the original Super AMOLED panel was to be found in its PenTile matrix subpixel arrangement. It employed an RGBG pattern, wherein you got two green subpixels for every pair of red and blue ones, but the overall resolution was counted on the basis of green subpixels. Ergo, a PenTile 800 x 480 resolution wasn't as rich at the subpixel level as your standard RGB screen (768,000 versus 1,152,000), which resulted in slightly grainier images than would otherwise have been the case. Well, that "otherwise" scenario is now with us, because Samsung has switched to a Real-Stripe RGB array in the 4.3-inch Galaxy S II, which means it packs the full 1.152 megasubpixel count and, as we've already noted, the display looks delectable for it. A lesser criticism of the original Galaxy S was that its colors were a little blown out and oversaturated, but that's once again rendered moot on the successor device -- a software setting called Background effect allows you to tweak saturation, so if you're feeling a little melancholy, you can tone down the intensity of your handset's colors to match your ennui. Basically, if we haven't made it clear already, this is everything that Super AMOLED was, minus the bad parts and plus an extra .3 inches in real estate. A triumph. Okay, there is one mildly irritating aspect about the Galaxy S II's screen and that's the auto-brightness -- it tends to hunt around for the correct setting and occasionally makes jarring jumps between darker and brighter values. Whether that's down to the ambient light sensor or the software reading data from it isn't all that important, what's relevant is that we found ourselves more comfortable with a human helming the brightness controls. 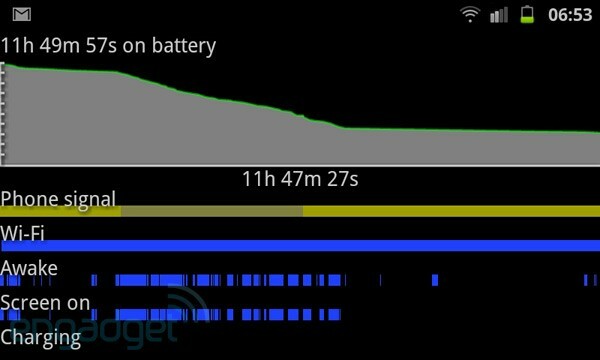 The story of the Galaxy S II's battery life cannot be told without returning to its luscious screen. Being an OLED panel, the 4.3-inch display here doesn't use one single backlight as LCD screens do, and instead only illuminates the pixels that are needed to actively display content. This is the reason why it can generate truer blacks than any backlit panel, but it also permits the user to optimize battery life by doing such things as switching to a darker wallpaper or reading ebooks against a black background. We didn't actually bother with such tweaks, we were too busy exploring every one of the myriad features on this phone, but the option's there as an extra dimension of obsessive control if you care for it. 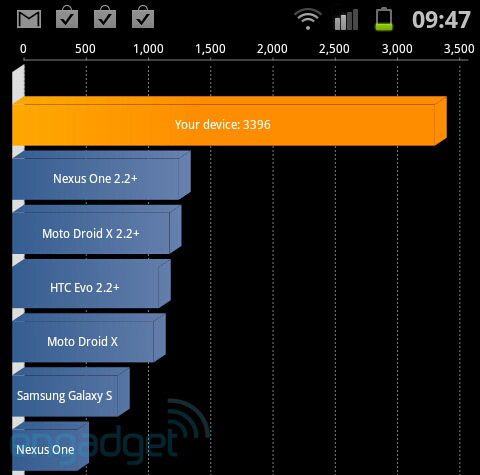 As to the Galaxy S II's actual endurance, we found it highly competitive with the latest batch of Android phones. After 20 hours, half of which were filled with the above tinkering and exploration, we managed to drag the Galaxy S II down to 15 percent of its original charge. This was with our usual push notification suppliers, Gmail and Twitter, running in the background and while constantly connected to our WiFi network. Using the Android System Info app (available for free on the Android Market), we found confirmation that the Galaxy S II is indeed running a 1.2GHz ARMv7 dual-core processor, but more importantly, we also dug up a breakdown of how often the SOC was reaching that max speed. Only 9.2 percent of our use harnessed the full 1.2GHz, with Samsung wisely downclocking its chip to as low as 200MHz when the phone's idling (that accounted for 46 percent of the Galaxy S II's uptime). What's impressive about this is that we never hit upon any performance bumps to indicate that we were running at slower speeds. Clearly, Samsung's power management system is doing its job well. In summary, we expect you'll be able to get a decent couple of days' regular use out of the Galaxy S II -- our experience with it came close to what we got out of HTC's Incredible S and Desire S that recently crossed our review bench -- though processor-intensive activities like HD video playback will eat into that, as will the variability of 3G coverage. What we can say with absolute certainty is that the Galaxy S II is no slouch when put against its contemporaries, and it also marks a definite improvement in longevity over the original Galaxy S.
The loudspeaker is surprisingly passable, hell, it's more than passable. We're probably being swayed by the gorgeous screen on this phone, but playing back video without relying on headphones feels just fine, unlike the usual grinding chore that it is on most current phones. That being said, Tinie Tempah's Pass Out -- a song that starts out dominated by deep bass -- sounds like a hilarious remix of the original on the GSII owing to the speaker's inability to dip down low enough to sound out the track's bassline. Bass deprivation is a typical shortcoming of smartphones, which isn't looking likely to find a fix any time soon. You still won't be forced to abandon your dubstep addiction while on the move, however, as Samsung bundles a solid pair of in-ear headphones that do a very respectable job of both isolating external noise and delivering audio to your cranium. Including an in-line mic that doubles as a music play / pause button is no bad thing either. We'd be remiss not to point out that the Galaxy S II's loudspeaker is positioned rather poorly -- it and the two slits cut into the phone's rump for its output face the rear. Laying the handset down on a flat surface immediately alters the sound and a stray finger - a single fleshy finger -- can mute almost everything. 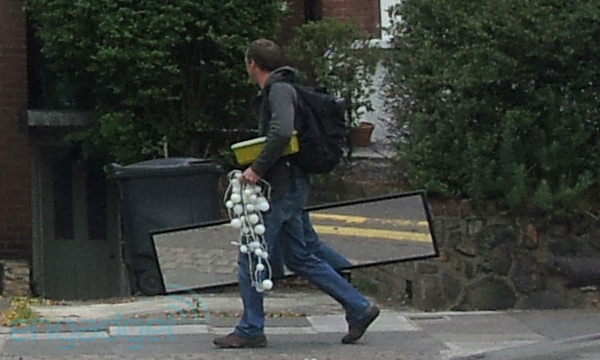 The earpiece performed as close to the middle of the road as you can get. Calls sounded good on our end and equally so on the other side. We had a couple of garbled moments during one conversation, but that's more likely due to network performance than some fault on the Galaxy S II. As to the network itself, the GSII exhibited no reception issues or aberrant behavior, though we weren't able to check out its rated 21.1Mbps HSPA+ speeds on our UK carrier. Samsung eschews the default Gingerbread camera app for its own effort, which comes with a neat slice of customization. The left menu column gives you three shortcut slots for the functions you consider most relevant to your photographic exploits. By default, two of them are populated with a button to flip between the rear-facing 8 megapixel and front-facing 2 megapixel camera and another one for controlling the flash, but you can do whatever you fancy. Resolution, ISO, scene and shooting modes, or adjustments like white balance, contrast, metering, and after-effects can all be included in there. And if you consider different things important when in video mode, that's no problem, because that retains its own set of shortcuts separate from the stills mode. It's a fully realized suite of options, even if most users will neglect the left side and just keep bashing the capture key on the right. When they do so, they'll be treated to some excellent results. The camera compartment on the back of the Galaxy S II justifies its size (it's still tiny, it just happens to protrude a little bit from the ultrathin GSII body) with the collection of great detail in nearly every shot. What most impressed us about this sensor is that images remained relatively sharp at full resolution -- such as the one you see above, it's a 100 percent crop from an 8 megapixel capture -- with Samsung feeling confident enough in the quality of its hardware to apply almost no noise-reducing blur under default settings. That does permit for graininess to sneak into some images, but on the whole, we're looking at one of the finest smartphone camera sensors around. Closeup shots are handled very well too, in spite of the lack of a dedicated macro mode (Update: There's a Macro setting under the Focus mode menu; thanks, Josh!). The flash is a typically overpowered LED unit, though we were impressed to see the Galaxy S II use it while focusing on a nearby object but not while shooting -- had it been used in the shot, the flash would've whitewashed the entire composition, so it's good to see the software showing a timely bit of restraint. The only real issue we encountered was that that the GSII's sensor has a predictably narrow dynamic range, meaning that photographs with high contrast between dark and well-lit areas end up with either deep shadows or blown out highlights, depending on which you opt to focus on. Then again, that can lead to some highly artistic / moody shots, so we're not too sure this is a major downer. A limitation, sure, but not something that will seriously impact your enjoyment of snapping pics with this phone. As to video, it too looks crisp and sharp, though the ever-present rolling shutter effect is very much in evidence when there's rapid motion on screen (see the bus passing by in the sample below). Provided you don't insist on panning around too quickly or recording hound races from the sidelines, that shouldn't pose much of a problem. There's little in the way of image stabilization too, but again, so long as your ambitions stretch no further than casual HD video, the Galaxy S II should prove more than sufficient. Even when pushed to record at 1080p, the Galaxy S II showed no sign of slowdown or even any processing lag. Speed of operation, both in stills and video, is as fast as we've seen yet. The time taken to enter the camera app, process one image and be ready for the next, and to switch between camera and camcorder modes was in all cases supreme. We consider that a big part of a successful camera's mechanics -- being able and ready to respond to the user immediately instead of making him -- so the Galaxy S II scores another big tick from us. Samsung also provides a Photo editor app that lets you tweak, crop and stylize your imagery. It covers all the basics and throws in a few fun extras for those who like to experiment. General responsiveness is absolutely exemplary. If you've read what we had to say about the G2x and the way it simply flies through homescreens, menus and applications, you'll know that we have a high bar for Android performance already set, but the Galaxy S II beats it anyway. There's simply never been an Android handset this smooth and this fluid in its operation. Nothing phases the GSII, and the only time we got it to show any performance dropoff was in enacting a pinching gesture on the home screen to bring up an Exposé-like overview of all seven homescreens. That's seven fully loaded-out homescreens with information updating live (multiple clocks plus news and weather feeds) and the only thing that recipe for memory overload produced was a slight stutter in animating the zooming effect. There's just no getting around the extravagant amounts of power this device has and we can't wait to see Samsung jam one of these Exynos chips inside a future tablet or two. We know you like your benchmarks, so we might as well hit you with those all-important numbers. Do take heed, however, that graphical tests such as those in Quadrant and Neocore perform at the phone's native resolution, which will bias results in favor of lower-res screens -- so don't take what you see as a conclusive performance comparison, use it just as an indicator. With that out of the way, here are the scores: Quadrant gave us results in the 3,000 to 3,400 range, Linpack produced an average of 47 MFLOPS, and Nenamark and Neocore both brought in a 59.8fps average that was limited by a 60fps software cap on the phone (a suspicion that was further confirmed by running Fps2D and seeing the same behavior). It's a shame that we weren't able to properly quantify the true maximum capability of the Exynos dual-core chip and Mali-400 graphics within, but that Quadrant score can be taken as highly representative of the chasm that exists between the Galaxy S II and smartphones that have come before it. It really is that much better. Put simply, this is the most powerful mobile handset we've yet tested. Browser performance is superb in terms of speed but a little troubled when it comes to rendering. In our use of the Galaxy S II, we were consistently met with pronounced aliasing when viewing webpages from a more distant, zoomed-out view. There were no issues in terms of the structure of the page, all sites organized themselves exactly as their makers designed them, but pulling out for an overview brought out the jaggy lines and generally looked unattractive. That's not, however, a functional flaw, it's just a superficial scratch on a muscly brawler. 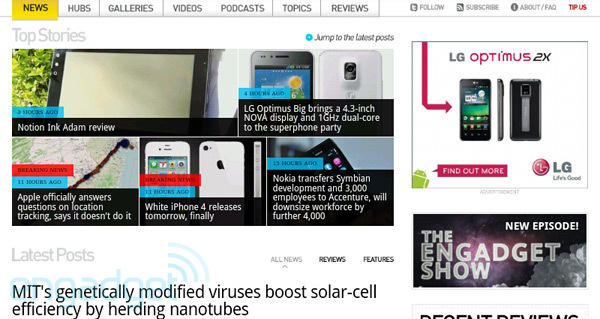 In terms of actually navigating webpages, the Galaxy S II is outstanding. Page scrolling is so smooth it borders on slippery, pinch-to-zoom is flawless, and re-orienting the screen from portrait to landscape and back is done in a flash. Oh, did we say Flash? One entirely aberrant aspect of our review handset was that we couldn't get it to play back any in-browser Flash content. Instead, it encouraged us to upgrade our Flash Player. We did so, downloading and installing Flash Player 10.2, but still had no joy. This seems like an unhappy fluke and we'll see how Samsung responds to our queries on the matter. Update: Thanks to our reader David, we've now figured out the root of this little problemo. Turns out the browser required us to tick an "enable plugins" box to get Flash running. We did so and, sure enough, in-browser Flash was a go. Frame rates have been consistently high across multiple websites and videos, which is in keeping with the rest of the Galaxy S II's performance. Android should already be a familiar friend (sometimes foe) to most of you, so we'll just go ahead and dive right into what Samsung has built atop the Android 2.3.3 base on the Galaxy S II with its latest set of OS customizations, dubbed TouchWiz 4.0. For a deeper exploration of what's new and improved in the Gingerbread iteration of Google's operating system, check out our Nexus S review. We start at the inevitable beginning, namely the lock screen. The Galaxy S II's lock screen won't offer the same hotbed of activity that you might find in HTC's new Sense 3.0, but it does come with some pretty awesome functionality of its own. Missed calls and unread messages become little tabs on the side of your locked GSII, which you may swipe into view and thereby unlock the phone straight into the message or call that needs your attention. It's slick, as fast as everything else on this speedster of a phone, and it adds real utility to your day-to-day use. Speaking of calls, your options when receiving one are to to pick up, hang up, or reject with a text message -- with a slide-up menu offering you the most common apologetic missives to send out. When the shoe's on the other foot and you're seeking to reach out to your nearest and dearest, swiping right on their name in the Contacts list will initiate a call, while swiping left will start the composition of a text. Each contact card also comes with a history of communications between you and the other party, providing gentle reminders of when you last checked in with your neglected friends. The Galaxy S could do some of this fancy stuff too, but that shouldn't take away from the fact that we're looking at genuinely useful additions that enhance the Android user experience. Long-pressing the Home button brings you to an app switcher exhibiting six of your most recently active apps, with a Task Manager loitering with malicious intent beneath them. Entering that Manager lets you view active tasks along with their RAM and CPU cycle consumption, with an option to kill them if you feel it necessary, and to then flush from the phone's memory any remnants of their operation. Not that you'll really need to be micromanaging either of those things with 1GB of RAM and oodles of processing power, but still, it's a useful feature to have. Also available is a Program Monitor widget for your homescreen that shows the number of active applications at any given time and links you into the same Task Manager menu. Looking at its fluctuating count, we could see the phone was selectively deactivating some apps as we increased the number of open programs. That never led to us losing data or having to restart apps, so whatever resource management is kicking in looks to be doing its job judiciously and with precision. Samsung also throws a trifecta of motion sensor-assisted functions into the Galaxy S II. The first is something you might be familiar from HTC's Sense: flipping the phone to face the floor mutes all sounds, whether they be incoming calls or media playing on the device. Unlike HTC's implementation, however -- which had an unfortunate tendency to be hit and miss in its recognition -- Samsung's "Turn over" feature works without hitch each and every time. We're big fans of this seemingly benign option because it combines the physical gesture of turning the sound source away from you with the software response of switching all audio off. It feels natural and can be seen as a representation of where phones may and ought to be headed, to a place where they predict and judge your intent using a higher level of intelligence than the usual impassive expectation of conventional input. The other two motion controls are truly novel and, we suspect, will be quite neat party tricks for Galaxy S II users to show off. Tilt-zoom gives you a new way to zoom within the browser and picture gallery app, whereby you tilt the phone up to enlarge an image or down to shrink it. This is activated by placing two fingers on the screen simultaneously and comes with a sensitivity adjustment for users to tailor it to their whims. We don't know if we'd ever come to use tilt-zoom over the tried and tested pinch-to-zoom functionality -- which is naturally also present here -- but the Galaxy S II makes zooming of any kind a pleasure to behold. As already outlined above, this phone just executes zooms and animations exactly as they were meant to be done. Having dealt with tilting, Samsung also gives us a panning motion function, which comes in handy when reorganizing your homescreens. There are seven of them in total and any grizzled Android user will know the chore of having to transition through multiple screens to get an icon positioned just right. Samsung's bright idea here has been to use the accelerometer to recognize the phone's lateral motion and react to it by moving you through the homescreens. This motion-aided panning is only accessible when you're rearranging your widgets or shortcuts, but once you understand that a 90-degree turn will jump you three homescreens in a given direction, navigation can be made delightfully quick. The Galaxy S II's onscreen keyboard is terrific, allowing us to get up to a fast typing speed within almost no time at all. Samsung needn't feel too smug about it, though, as this is an almost identical recreation of the default Gingerbread button pad. The Korean company has opted to include a dedicated button for voice input in the place of the comma, which is now relegated to hanging out with the rest of the punctuation crew in the secondary keyboard mode for symbol / numerical input. We're not thrilled by this change, as we use commas a hell of a lot more than voice input, but we recognize the reason why Samsung did it -- two of its pre-launch ads for the Galaxy S II were focused on the use of its Voice Talk feature to perform effortless handsfree communication. Only problem is that the reality of using the Vlingo-powered Voice Talk is more an exercise in frustration than anything else. It's also been given priority by dedicating a double-tap of the Home button to it (from wherever you are on the phone), but once you actually get into the app itself, you clash with slow (purely because of the software) operation, a consistent failure to properly recognize common words, and a generally unrewarding user experience. It's a gimmick, pure and simple. Whatever value you extract from using it will be be the result of sheer stubbornness on your part rather than good software design. Alas, we can't say anything much more positive about Samsung's set of Hubs on the phone. There are Game, Music, Readers, and Social Hubs, however we found everything other than the ebook reader a waste of time. The Game Hub doesn't yet offer anything that differentiates it from simply searching out games on the Android Market, the Music Hub tries to sell you stuff without providing a compelling reason to jump into yet another online music store, and the Social Hub tries to convince you that you need it to organize all your social feeds, messages, and email. Such centralized control might have been handy earlier on in Android's development, but the native Gmail and Gtalk apps have evolved to provide trouble-free use, while the Twitter client for the platform is now more than mature enough to handle itself. What we're looking at, then, is redundant functionality. The Readers Hub, as we say, is the one that we can see ourselves actually using, mostly owing to the inclusion of the Kobo e-reader software, though it too seems geared more toward selling you stuff than actually serving users' needs. We'll finish off with a quick run through the rest of Samsung's additions to the Android experience. Sharing over DLNA is made stupidly simple with the AllShare app, and if you're on a Windows PC, you can just browse through the device's stored music, video and pictures and access content on the fly. The whole process is as seamless as it is wireless. The persistent "dock" at the bottom of the homescreen is not customizable (Update: Turns out that you can tweak the first three icons in the bottom dock -- this can be done by accessing the apps menu and choosing to edit its arrangement; thanks, Rein!). The Applications menu isn't the best we've ever seen either. Don't get us wrong, its navigation exhibits the same stupendous speed and responsiveness as the rest of the phone, but automated reorganization into alphabetical or date order isn't available. You can only switch to a list view or manually rejig the way the apps are listed on each page. Screenshots of whatever the Galaxy S II is displaying can be taken by pressing the Home and power buttons simultaneously. It's not yet a common feature among Android devices, but we'd like it to become one. We're also happy to see Samsung maintain its long-held tradition of providing some of the weirdest ringtones around, the vast majority of which seem wholly unsuitable for anyone but the most obnoxious of users. Nevertheless, we did manage to unearth a rare gem in the Cassiopeia tone, which sounds like a slowed-down version of the Metal Gear Solid codec chime. 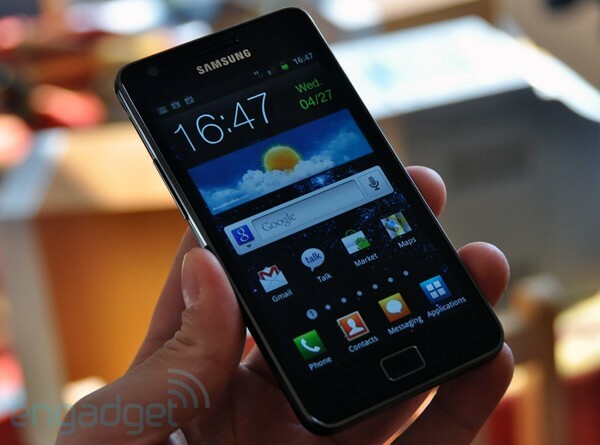 For a handset with such a broad range of standout features and specs, the Galaxy S II is remarkably easy to summarize. It's the best Android smartphone yet, but more importantly, it might well be the best smartphone, period. Of course, a 4.3-inch screen size won't suit everyone, no matter how stupendously thin the device that carries it may be, and we also can't say for sure that the Galaxy S II would justify a long-term iOS user foresaking his investment into one ecosystem and making the leap to another. Nonetheless, if you're asking us what smartphone to buy today, unconstrained by such externalities, the Galaxy S II would be the clear choice. Sometimes it's just as simple as that.